The Jean & Paul Amos Performance Studio is a 10,000 square foot television studio which can accommodate a variety of events. Located on the west side of the WSRE Kugelman Center for Telecommunications on the Pensacola State College campus and across the street from Pensacola International Airport, the studio can be used as a soundstage, a performance venue and as a location for large public or private events. In addition to WSRE's own local/national television productions, the Amos has hosted numerous concerts, lectures, fashion shows, music recitals, dance recitals, pageants and plays since it opened in 2005. WSRE works with non-profits and other organizations to produce local and regional cultural productions for broadcast on WSRE from the Amos Studio, as well as launch new talent to be aired regionally and nationally through PBS, increasing organization exposure. Community organizations, businesses and churches have successfully utilized the space, layout and convenient location offered by the Amos Studio. 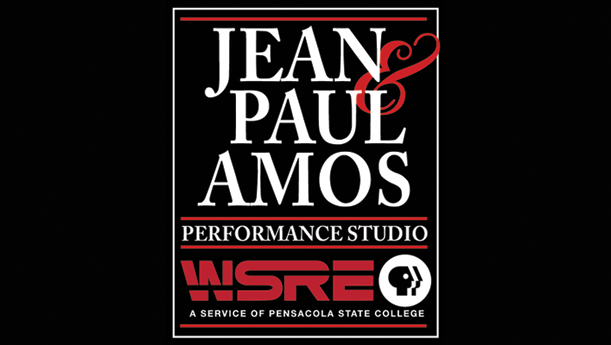 The Jean & Paul Amos Performance Studio was built to support the mission of WSRE, serving as a community resource and providing valuable services and educational outreach to the citizens of the Gulf Coast community. Funding for the studio's construction came from many sources including major donors, matching dollars from the state legislature, and the lead gift of $500,000 to the FutureVision Capital Campaign from former Northwest Florida residents Jean and Paul Amos. Paul Amos was best known as a co-founder of Aflac, the world’s largest supplemental insurance company. He and his wife Jean had had resided in Columbus, Ga.; however, they first met during their formative years living in Milton, Fla. and were married 65 years before his death in 2014. The Jean & Paul Amos Performance Studio was named in honor of their generous gift. The Jean & Paul Amos Performance Studio is the perfect venue for a variety of events. The studio is self-contained and can be used for large public or private events; for musical, theatrical and dance performances; and as a soundstage. In addition to WSRE's own local television shows, the Amos has hosted numerous concerts, lectures, fashion shows, music recitals, dance recitals, pageants, and plays since it opened. Community organizations, businesses and churches have successfully utilized the space, layout and convenient location offered by the Amos Studio. Our Studio Director can guide you from start to finish. Need your event catered? We have tables and chairs, as well as a list of caterers familiar with our venue! Have people coming from out of town? The Amos Studio is conveniently located across the street from the Pensacola Regional Airport and near several hotel, shopping and dining locations in Pensacola. Our open downstairs lobby has room for sponsor tables and event merchandise or it can be used as mingling space for guests prior to your event. Entrances from both sides of the lobby lead into the studio with easy access to the studio's guest elevator. The upper lobby is an additional location perfect for a reception or other gathering. Its open design and large windows provide a comfortable setting for guests to mingle before and after a show. The studio breakout Redroom (25' x 30') is the ideal space for sponsor parties, private pre-show meetings, or additional dressing room space for large casts. Adjacent to the breakout room is a Setup Area complete with refrigerator, ice machine and ample counter space for your event's reception or catering needs. If you need a temporary office or a private room, additional production office space is also available. Backstage, you will find a dressing room area as well as the Green Room. The dressing room area, located directly behind the staging area, includes four small dressing rooms, two lighted makeup areas, and restrooms with showers. The dressing rooms and Green Room are all equipped with sound monitors. The Amos also offers a ticket booth and public restrooms. Consider the Amos for your next show or event!